1. Preheat the oven to 220°C, gas mark 7. Remove the chicken from the fridge 20 minutes before cooking. Place the potatoes, shallots and garlic into a medium roasting tin. Season the chicken and rub it all over with butter before placing on top of the vegetables. Roast for 45 minutes. 2. 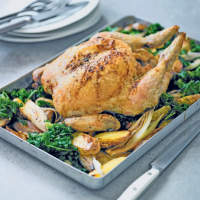 Cover the chicken with foil and roast for another 30 minutes, or until golden brown and piping hot, the juices run clear and there is no more pink meat when tested at its thickest part (between the leg and breast). Set the chicken aside to rest, loosely covered with foil. 3. Put the roasting tin on the hob, add the chicken stock, bring to a rapid boil over a high heat, stirring occasionally, until the liquid reduces by at least half and the potatoes and shallots are very tender. Discard the garlic. 4. Add the kale, cover and steam for 2-3 minutes more, until just softened. Stir in the vinegar and seasoning, to taste. Carve the chicken, adding any resting juices to the vegetables. Serve at once.